Marketing and insight clients often ask us: How can I get a picture of how all my touchpoints work together? How can I understand the effectiveness of owned and earned media as well as paid media? Which media should I be putting my budget towards to get a better bang for my buck? How can I become less reliant on paid media? These are important questions that go to the heart of media and communications strategy and planning. 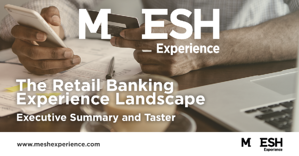 That’s why MESH Experience created the Real-Time Experience Tracking data stream for the UK retail banking sector. It captures how people experience the category across all relevant brands, and all touchpoints – paid, owned, and earned experiences – via a mobile diary method. And then we can understand not just what you’re pushing out, but what people are taking in. There are many touchpoints in the sector, so it’s rich territory for our analysis. For example, we find almost half peoples’ experiences are driven by paid media. TV alone has a 47% reach and constitutes around a quarter of all experiences. Owned experiences are almost as significant, with online banking, branch, the brands’ websites and so on all having a strong role. Then there is the earned category – the small but significant background hum of word of mouth (often positive) and news (often negative). On that note, because the experiences are captured in the moment, we get an instant reading of how positive they are, and how persuasive (i.e. does that experience make the person more likely to consider the brand). You can see what’s working and what needs fixing. 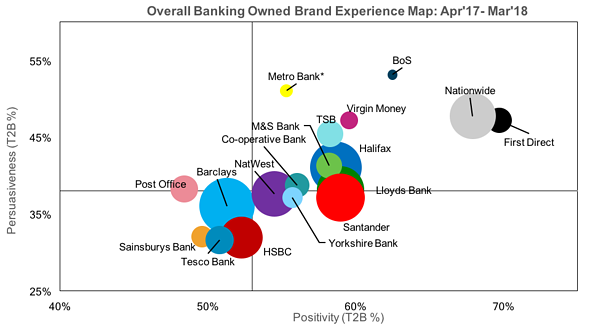 If we look at the chart below, we immediately discern the broad landscape of the banking sector, and how people really perceive their experiences through the lens of different touchpoints. 27% of retail banking experiences are from TV – mainly paid campaigns. Banking is a busy market for advertising. And 59% of these experiences are positively received, the highest of all paid media. What’s also interesting is that while cinema ads are relatively niche, in the context of having peoples’ full attention they command greater persuasiveness and are more likely to make people choose that bank next time. 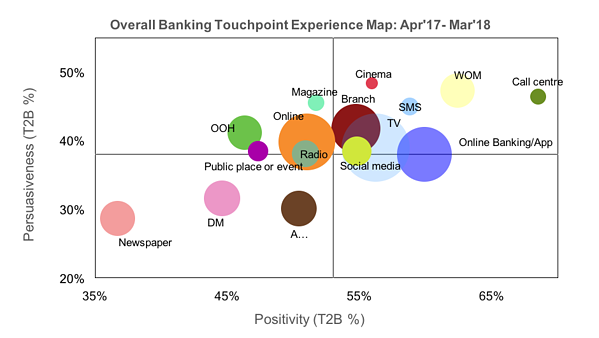 Online banking and mobile apps generated 13% of experiences, the highest of owned touchpoints – again, very positive in the main. We find that much as people like to moan about call centres, these experiences are generally good – digging deeper, we find that the experience of resolving a problem with another human being is a vital part of the banking relationship. Newspapers stand out for negativity. The reason is simple; a steady low level drip of negative news, often with the long shadow of the financial crisis in the background. In this atmosphere of low trust, WOM from friends and family can be some of the most positive and impactful experiences. But the category view is not the whole story. Because we have amassed so many experiences in our database (27,000 and counting) we can then dive into the data to find out which brands are reaching people via different touchpoints, and which banks are performing well, or less well, in these touchpoints. For example, Santander has strongest reach via its owned channels; TSB reaches people disproportionately through paid (and particularly via its engaging TV campaigns). Turning to paid TV ads, TSB is the standout performer for positivity. Halifax, Lloyds, and Barclays are all highly rated; HSBC far less so. When looking at owned media, Santander may reach the most people but the standout performers here are Nationwide and First Direct, for very different reasons. Nationwide excels in its branch experiences, which are best in class by some margin. First Direct’s excellence lies in its website and online banking experience. All this helps our clients understand how the roles of different media are changing, and how media and channels work together. This helps with planning how to make the best use of all available touchpoints, and contextualises paid media against the all-important owned and earned channels as well. This is just a brief flavour of the richness of the retail banking experience data stream. So if you want to monitor yours and your competitors’ performance, why not talk to us about our FREE Retail Banking Experience Landscape Report? Share of Experience (SOE): % of experiences picked up for a brand or touchpoint out of all experiences in the category. Reach: A measure of cut-through; the proportion of participants who have had an experience with a brand or touchpoint, during their week of reporting, out of total sample. Positivity: An emotional measure of real-time engagement with the experience. Based on 5 point scale. Persuasiveness: A rational measure of real-time engagement with the experience. Based on a 5 point scale.